The Northern Pact encompasses principles that outline the expectations we have for members of our community–being purposeful, just, caring, open, disciplined and celebrative. Each year, the Division of Student Affairs awards the Northern Pact scholarship to students who share this vision of service and personal responsibility. Anthropology major Jack Beutler, a 2017-18 Northern PACT Scholarship winner, in Cole Hall. 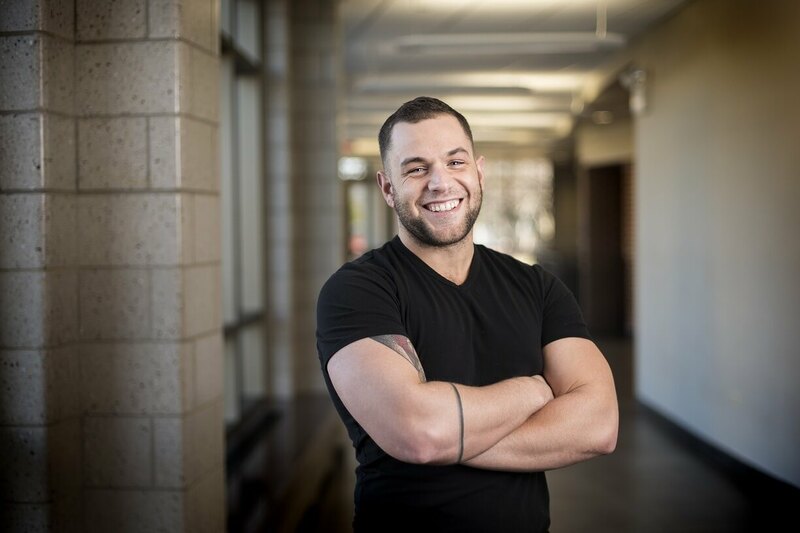 Meet transfer student Jack Beutler, one of the recipients of this year’s scholarships. What does having a Northern Pact mean to you? There’s a pretty quick transition from high school to college — and it’s a really big culture shock — so having something like the Northern Pact and prioritizing it, making sure people know it and acknowledge it, helps people transition along. It allows people to get on the level of that transition from high school to college to real life. Making that a priority is pretty [important] to being happy and enjoying yourself. Which Northern Pact Principal do you relate to the most? Celebrative, one of the last things Christopher McCandless wrote was, ‘True happiness is shared.’ I didn’t necessarily believe that for a long time, but the connection and enjoyment you get from other people is so important in life. When everything else is stripped away, that’s one of the few things that actually sticks around that is enjoyable and celebrated. Interacting is a cause to celebrate. How has transferring to NIU impacted you? The transition was really easy. NIU was really helpful. They provided a great orientation and a lot of different resources that I used to get where I want to be now. What advice do you have for future transfer students? Stay positive and enthusiastic. When I was younger, I was very negative during my first go-around at college and was not very open to things. So stay positive and be willing to try things that would allow you to really experience NIU to the fullest. Get involved in everything because it will all help you land the job you want after graduation. What do you like most about NIU? The professors. I really like listening to them talk about their research. The degree of expertise they have in the anthropology department is really cool and they’re always open to meeting with you one-on-one. Why should other students choose NIU? It’s got a lot of great stuff to offer. It’s relatively close to Chicago, so it’s easy to commute if you want. Campus is great, too. There are a lot of cool events. Do you know students who exemplify the principles of the Northern Pact? Encourage them to apply online for the 2018-19 Northern Pact scholarship.